Recent studies have shown that some 20 million – yes, that many – people in the UK have at least one tattoo. Those same studies show that lots of people live to regret that decision and choose later on down the line to have their ink removed. Traditional (and by traditional we mean Q-switch lasers, not anything icky like chemicals or cutting ink out) tattoo removal treatments require anything from 10-20 sessions spaced weeks and weeks apart. Which is pretty boring and annoying if you’ve got a tricky Tweety Pie you can’t bear to look at for one more second. Fortunately, there’s a new ink-destroying superhero option on the market, and his name is Picosure. 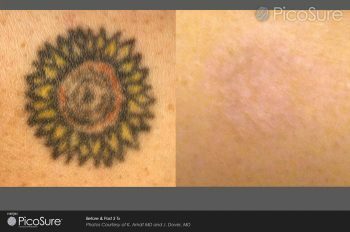 The technology behind PicoSure has never been seen before – it’s the only tattoo removal method that uses picosecond technology. That means that it uses ultra-short pulse bursts of energy that hit around once every few trillionths of a second. Rather than heating the skin (and ink) to encourage particles to be reabsorbed, Picosure simply breaks them into such tiny pieces they melt right away. And it’s done! Of course, getting laser treatment is never going to be completely pain-free. During the session your tattoo may turn white, and may even blister. It’s an easy fix though – simply keep the area covered for the first day and don’t rub against or scratch it. Book your appointment today and we’ll fill you in on any other aftercare details you may need. For further information about the PicoSure laser, please visit this page.